Yellowstone National Park is the first national park in the world. This spectacular park spreads out in three states: Wyoming, Montana, and parts of Idaho. The awe of Yellowstone will never find words for what the eye needs to see. The Rocky Mountain range stands proudly peaked throughout the whole park, giving abundant and even endangered wildlife a home. 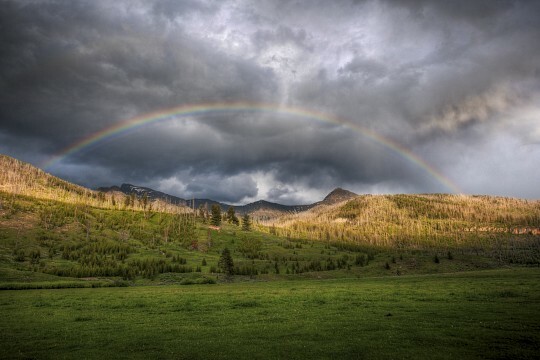 Of all of earth’s creations, Yellowstone National Park cannot be replicated. Yellowstone is the oldest park in the country, with more than two million acres set aside for permanent conservation. It is America’s top choice for vacations. In 1795, British explorer, David Thompson , had written the words “Yellow Stone” in his notes while he was with the Mandan village tribe on the upper Missouri. This originates from the head of volcanic stones which appear as yellow rock. Lewis and Clark were exploring Montana and were told of strange ‘thunder and earth trembles’ close to them and for some reason, they did not care to investigate. It was John Colter in 1808 who was the first white man to take in the pristine landscape of Yellowstone. Wild tales spun all throughout the east, met with unbelief. The outlandish stories continued with mountain man Jim Bridger speaking of waterfalls spouting upwards and petrified “trees and birds”, and the truth fell upon deaf ears. Yellowstone was left untouched by United States government for many years due to the American Civil War, the struggle over slavery, and skirmishes with native Indians. Aside from this, the rumors of this magnificent part of the country were still being greatly ignored. 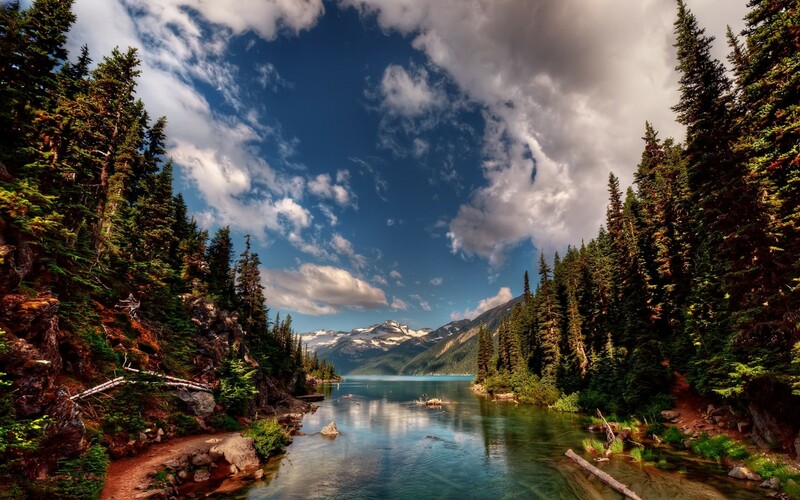 However, beginning in the late 1860’s gold prospectors, government and curious citizens were starting to visit the region, and always expressing the need to preserve this area from active commercialism. 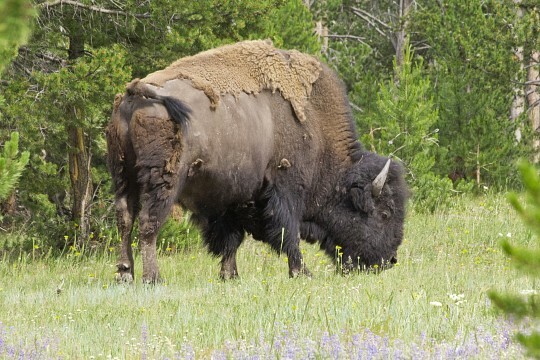 It was near death encounters with Indians, grizzlies, and buffalo which chased exhibition and gold prospecting parties out of the untamed Yellowstone. The mysterious and unbelievable Yellowstone became a reality to the nation after the famous Washburn party lost one of their own in Yellowstone. For thirty-seven days in the cold late fall, he wandered ultimately surviving the ordeal to tell his incredible story. An official exploration of the region in 1871 included a group of geologists, zoologists, botanists, an artist and a photographer. It was the photographer, William H. Jackson who provided the proof of all the wonders in Yellowstone, then the lobbying to make Yellowstone a national park began. The visitor tally to Yellowstone National Park soared when mass production of automobiles gave people the accessibility to travel. Under the increasing strain from humans, Yellowstone officials scrambled to manage the wildlife and protecting the park’s fragile features. President Woodrow Wilson forever changed the administration of national parks in 1916, creating new government agency, the National Park Service. 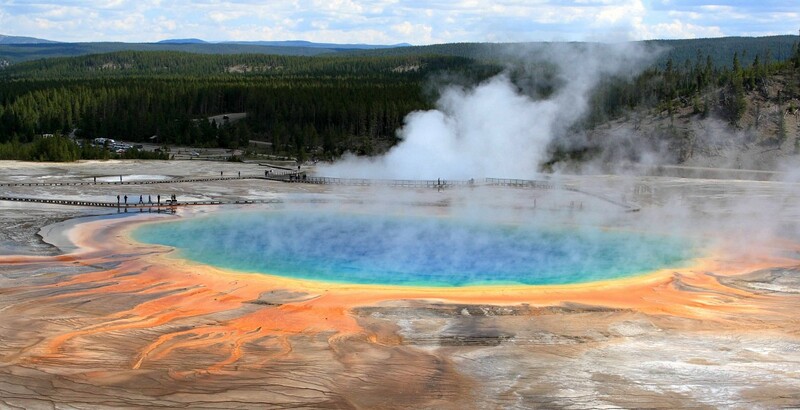 The Yellowstone Caldera is considered a super volcano. This is to say the ejecta volume is a thousand times larger than a normal volcanic eruption. Super volcanoes are unable to contain their pressure and magma pools occur to release some of the pressure through Earth’s crust. This is the case of Yellowstone National Park and the many geysers, hot springs, and the ‘swarm’ of small earthquakes. In one month, Yellowstone can see around 1,800 small magnitude earthquakes, sometimes even more than a 100 in one day. Yellowstone Volcano Observatory monitors the park’s earthquake activity around the clock. While Yellowstone volcano is considered a hotspot on earth’s surface, there haven’t been any eruptions in a very long time. Over 640,000 years ago an eruption occurred extending over 1,000 miles and creating the Yellowstone caldera in the center of the park. The last actual lava flow occurred 70,000 years ago. Yet only 50 years ago the most devastating earthquake ever to hit Yellowstone; the Hebgen Lake Earthquake measured 7.5 on the Richter scale. Quake Lake was born by more than 80 million tons of rock crashing into the narrow canyon, blocking the rushing Madison River. Parts of the main road collapsed and ended up on bottom of the new lake. Twenty-eight people tragically lost their lives in this earthquake. The result of Yellowstone being one of the world’s largest calderas (measuring 45 by 30 miles) has been seen in over 10,000 thermal features throughout the park. With over 300 geysers, thousands of petrified trees and over 290 waterfalls flowing year-round, this sacred little part of the world remains a jaw-dropping experience for all who enter. 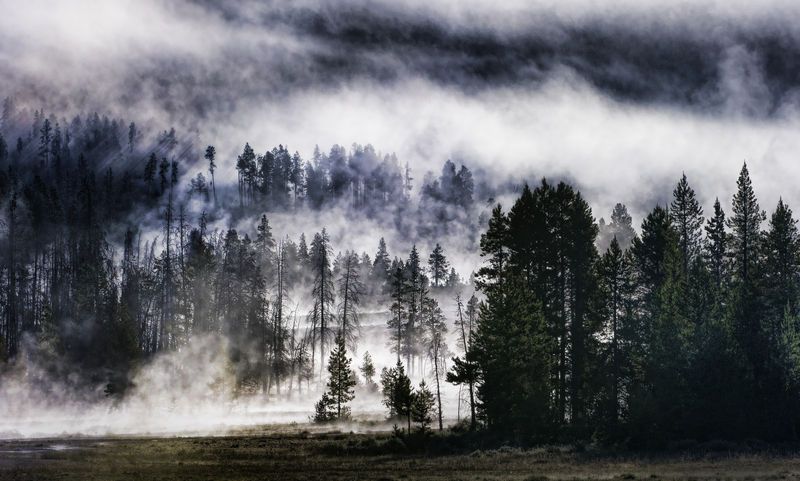 The memorable adventure at Yellowstone National Park is subjective. While many gasp in the roaming wildlife, others are smitten with one of the many geyser sites. For every visitor, there is a unique and individual play of events; no two trips are the same. Even the locals of the area visit often for refreshing new occurrences. Yellowstone is always up to the challenge; whether it is buffalo crossing the road, wolves roaming the pastures, or the bubbling pot geysers shifting colors, expect the unexpected. Yellowstone is broken up into sections on trail guides, to make it easier for visitors to navigate through the gigantic park, the minimum trip time is two days, and that is only seeing a little over one section of the park. Old Faithful: Beginning with the favorite and famous geyser of them all, is the star attraction of Old Faithful. Located in the Upper Geyser Basin area, Old Faithful is spectacular to watch erupt. It erupts more frequently even though it is not the biggest geyser or the most regular, with average interval between eruptions around 91 minutes. Always predictable, each eruption will last up to 5 minutes reaching grand heights of between 106-184 feet, and expelling up to 8,400 gallons of boiling water. Old Faithful is grandiose in her performance with happy applaud from surprised onlookers all while the park rangers tell stories of fascination about Old Faithful. Geyser Hill Loop Trail: The boardwalk trail here is short, only 1.3 mile loops around some pretty amazing geysers. Anemone geyser provides laugh provoking entertainment, and the Beehive Geyser will erupt in unpredictable ways reaching over 100 feet each time. 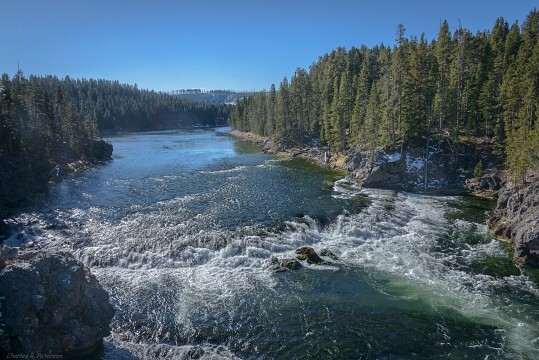 Observation Point Loop Trail: Take the Firehole River footbridge behind Old Faithful Geyser and climb about 200 feet to a scenic outlook post with a panoramic view of the entire Upper Geyser Basin. Black Sand and Biscuit Basin Trails: An accessible collection of less visited basins are found on a boardwalk trail less than a mile in length from Old faithful. Emerald Pool, Jewel Geyser, Sapphire Pool and Sunset Lake offer up some intriguing colored geysers. 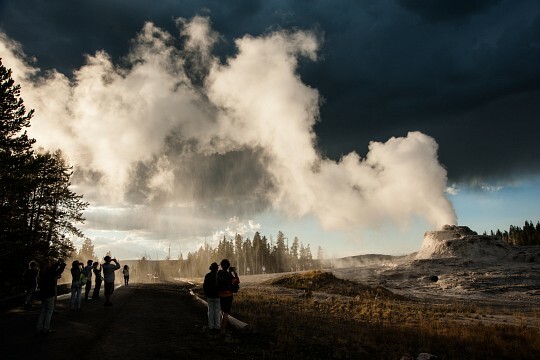 Lone Star Geyser Trail: This 5 mile round-trip adventure on an old service road traverses parallel along Firehole River and ends in reward in watching a lone, magnetic geyser erupt every 3 hours putting on a delightful show. 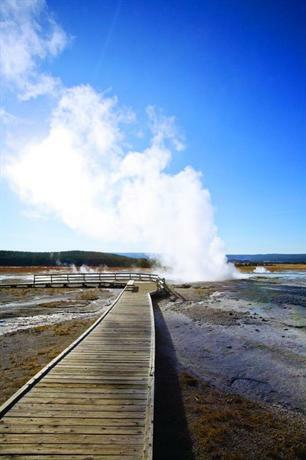 This trail can also be accessed by bicycle with the last approach to the geyser on foot. Mystic Falls Trail: This is a moderate 2.4 trail following along a beautiful lodgepole pine forest and trickling creek before unfolding into a spectacular vision of a 70 foot falls. The Grand Canyon here is not quite like the Grand Canyon in Arizona, yet it still presents nothing short of breathtaking. One of the most famous and photographed features in Yellowstone resides here called the Lower Falls which tumbles down the canyon at a exhilarating 308 feet high. Visitors can experience the stunning beauty by accessing the lip of the falls, however, it is recommended to see different views at vantage points available. 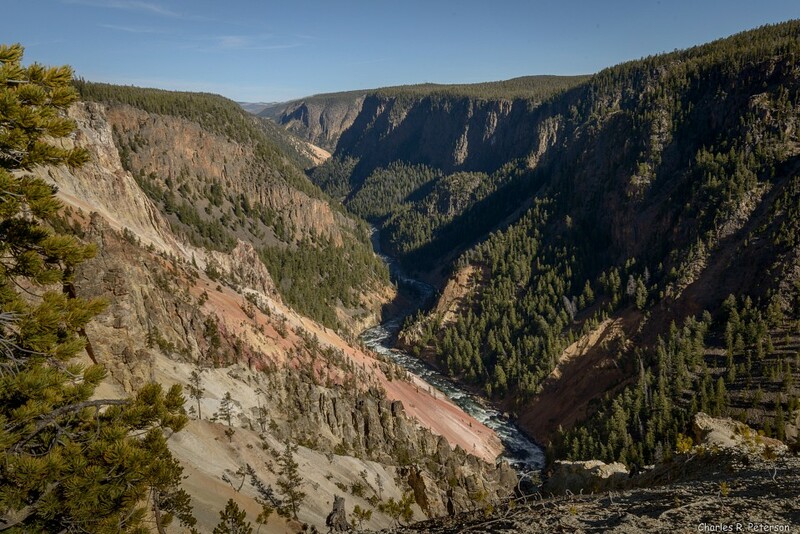 The Grand Canyon of Yellowstone has its own geologic story. It is not well understood how this canyon developed, only that it was formed by erosion rather than by glaciations . The historical significance is one of Native American lore and of early explorers and these stories are told at the important interpretive points. The grandeur of this canyon brings on a mesmerizing notion of disbelief as visitors try to understand how a place could be so absolutely beautiful. The canyon is over 20 miles long. Remnants of an old lodge and visitor center from the 1950’s still stand, and although not of historical significance, the old buildings are representative of the architecture of the time. Hayden Valley is the marshy side of Yellowstone existing without the expected encroachment of trees. The Hayden valley once held a part of Yellowstone Lake, and now covered with glacier till to create a thin layer of sediments keeping water from permeating beneath the surface. Access to Hayden Valley is easy as there are a number of roadside turnouts and scenic overlooks for panoramic views of the valley. The Yellowstone River is on the east side of the roadway and there is amazing views on both sides of the road. 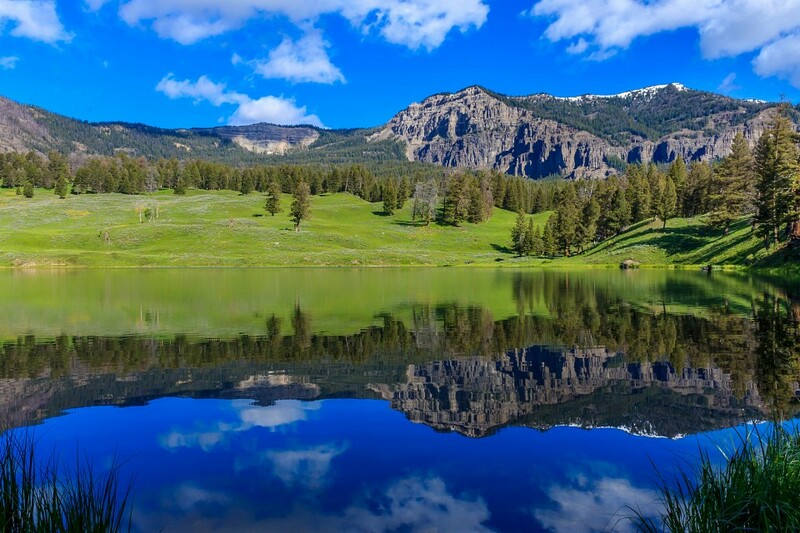 This valley is the first place visitors go to see wildlife in Yellowstone National Park. Herds of bison live here, often crossing the road and stopping traffic for hours. Alongside of the bison, it is common to see scattered elk, and an occasional grizzly bear. The Hayden Valley is home to many different species of waterfowl, especially ducks, pelicans and Canadian geese lounging near the Yellowstone River. 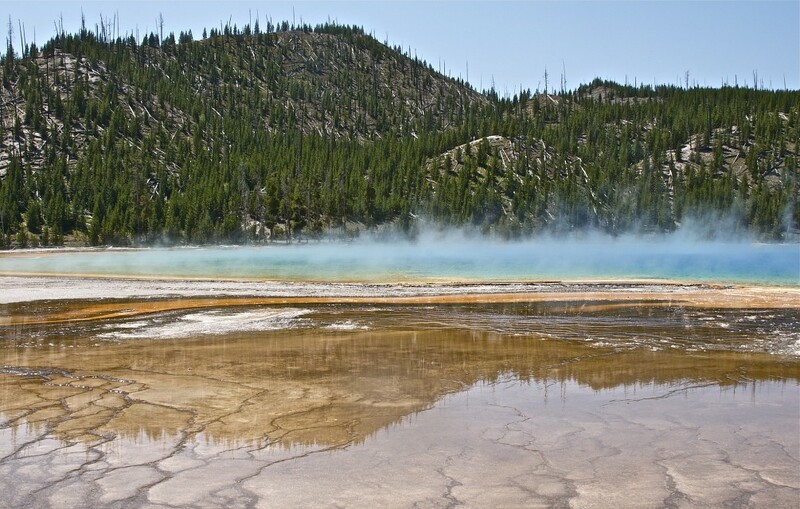 History of Yellowstone National Park begins at Mammoth Hot Springs. This is the park’s headquarters, featuring some of the oldest buildings in Yellowstone. The red-roofed buildings are from the era of the Cavalry managing the park resources and the visitors back in 1886, and was promptly called Fort Yellowstone. The Mammoth Hotel is built upon an old terrace formation in 1891. The drive is a must to Mammoth Hot Springs Terrace is magnificent, traversing across the hillside through Parade Ground (several large sinkholes can be seen here),and down to Boiling River to watch the ever-present elk quietly grazing on the surrounding green lawns. Mammoth Hot Springs attracts a lot of visitors even though the hot springs is an unpredictable force of thermal activity. Sometimes the hot springs can be overly active and other times to appear to have ‘died’. 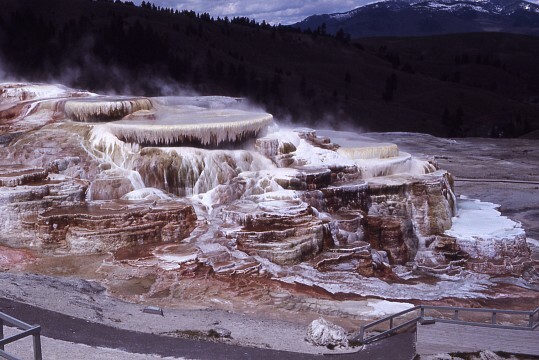 The rate of flow changes daily, as Mammoth Hot Springs are superficial expression of the deep volcanic forces at work in this region. Capitol Hill and Dude Hill are the major features at the Mammoth Village area. In early days of Yellowstone, the hot springs would attract people seeking pain reliefs in the mineral waters. Two major historical events happened at Mammoth Hot Springs, The Nez Perce fight of 1877, as well as President Teddy Roosevelt’s visit in 1903. 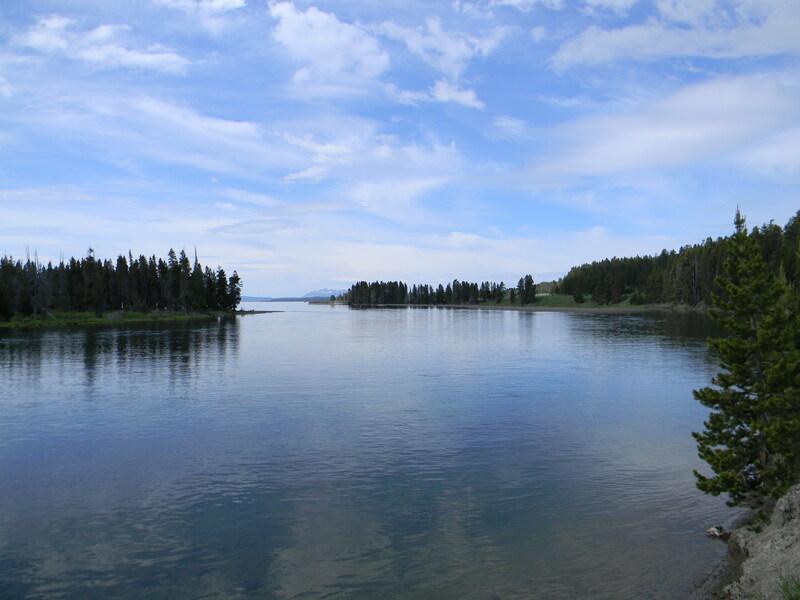 Yellowstone Lake in all of its grandeur remains the largest high-altitude lake in the lower 48 states. Even in July, the mountains rising across the lake remain snow-capped. On cold, windy days ocean-like white waves break onto the shore. Every view is appreciated and many visitors marvel at making snow balls in midst of summer heat. Fishing Bridge: In 1902, a rough-hew corduroy log bridge was built known as Yellowstone’s Fishing Bridge. It was a tremendously popular place to fish for almost 50 years. The fishing was so good due to it was a major spawning locale for cutthroat trout. As a result of the fishing practice, the cutthroat population declined and is still considered endangered today. In 1973, the Fishing Bridge was closed to fishing, but still remains a popular place to observe the cutthroat trout spawning. 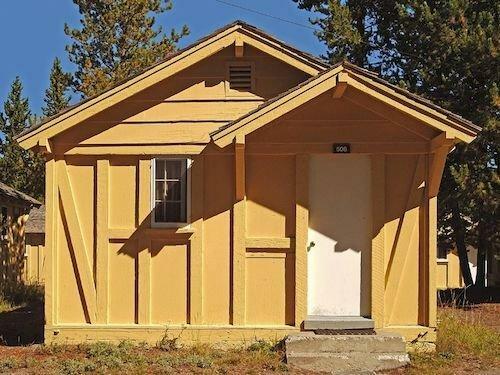 The prototype of rustic architecture throughout parks all over the nation came from the famous Fishing Bridge Museum of 1931, establishing the prototype. It features native rock and stone chiseled out of a rock outcrop as to be able to ‘see through the building’. Archeological Research: In the East Entrance Road, archeological research continues to be conducted with excellent results. Earlier studies found indigenous people lived in the lake area over 9,600 years ago. A variety of projectile points are being found as is hearth cooking structures, and a bison harvest site. Several miles of boardwalks mark this popular tourist area outlining dozens of multicolored thermal features. Norris Geyser Basin is one of Yellowstone’s most visited geyser basins and it is home to the almighty Echinus Geyser and the Steamboat (The world’s tallest geyser). Mix this with elk and bison and it becomes a phenomenal adventure. The basin is divided into two distinct sections, the forest setting of Back Basin where hot springs and geysers are tucked into the trees. The Porcelain Basin has no vegetation due to the acidic water emitted, but presents a beautiful array of desolate colored visage unlike any other geyser in Yellowstone. Norris Geyser Basin is always constantly changing with new geysers being born while others fade away. Steamboat Geyser: This star of Norris Geyser Basin can reach heights of well over 380 feet, so much that its steam phase can be heard miles away. However, eruption is rare with the last eruption in 1991. Echinus Geyser: This geyser was a crowd pleaser for many years until 1997 it began to slow down. Its erratic predictability has since thrown its star status off a slight, but is still a great show. Echinus Geyser is still the largest acid geyser in the world; most geysers are alkaline in nature. The Norris Geyser Basin is home to many smaller but fun geysers such as the Whirligig which makes chugging sounds and Constant Geyser which is a frequent performer. The Porkchop Geyser exploded in 1989 blasting the rocks up to 220 feet away; Emerald Spring is a beautiful palette of deep green and blue colored pools of water and outlined in brilliant yellow. There are dozens of geysers to marvel in at Norris Geyser Basin. 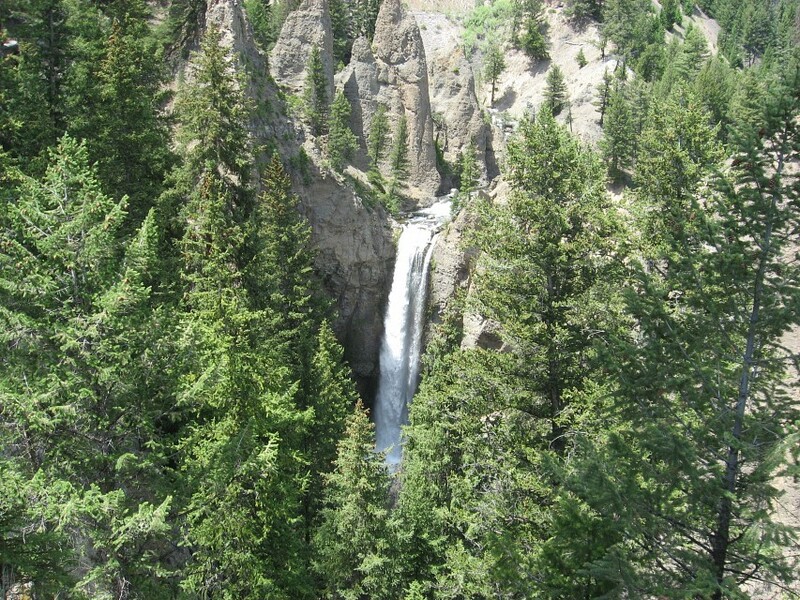 Tower Falls is located behind the old General Store with a short walk to an overlook. 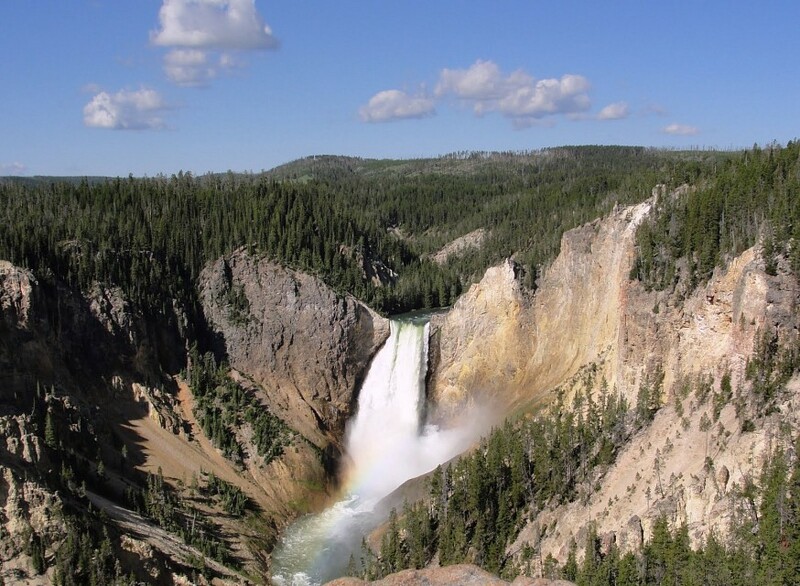 Visitors make these Falls the most popular in Yellowstone. A short steep hike will drop to the base of the waterfall for even more spectacular look. Tower Falls is also a destination for winter activities. During the winter, the entire 132 foot waterfall is encased in an ice dome. The largest geyser basin in this region of Yellowstone, it covers approximately 11 square miles and displays regularly erupting geysers and steaming hot springs. The Grand Prismatic Spring, centered in the Midway Geyser Basin, is the largest hot spring in the entire United States. The name was given to the amazing rainbow colored geyser due to the actual prism colors it emits. The circular prism is striking in orange, red, green, and blue; colors so brilliant it causes tourist's jaws to drop. The deep palettes of blue in the water (where the water is pure) create a red hue because of the absorption of red wavelengths from visible light. In the spring, this mineral rich pool is particularly intense causing pigmented bacteria to dispense shades of red and blue. As summer approaches, these colors fuse into dark oranges and deep reds, with the center of the geyser remaining pure in blue sapphire and topaz. Winter will turn the entire geyser into a pine green color. The impressive spring measures 300 feet in diameter and sits relatively close to its neighboring geyser Excelsior, a popular 50 foot geyser. Lower Geyser Basin is home to fun Fountain Paint Pots, a fascinating burping collection of colored mud pools which often strikes visitors as being something not of this world. The parking is small and often crowded but well worth the hassle. Celestine Pool is unfortunately the hot springs which tragically claimed a human life. The hot springs of Yellowstone are typically within a few degrees of boiling, there is little hope of surviving if a fall or slip happens. The Sizzler Geyser is a new geyser that appeared as solid ground but changed rapidly into a gaping hole. This stands as a reminder of the dangers of walking off trail in the geyser basins. Other interesting geysers in the Lower Geyser Basin include Clepsydra and Fountain Geysers. Both erupt almost constantly and wildly explode in all directions. The Fountain Geyser has a collection of the prettiest reflecting pools surrounding it. 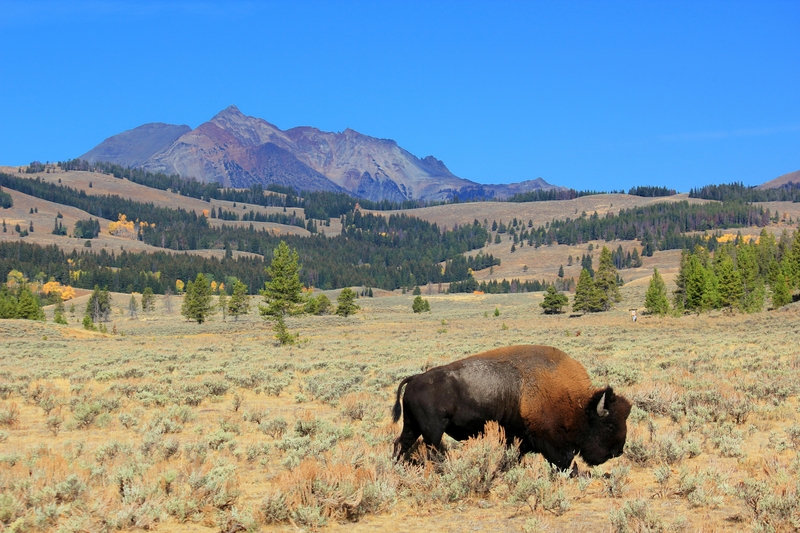 Yellowstone’s diverse and abundant wildlife population is as famous as the fascinating geysers. Yellowstone has 67 species of mammals and 322 recorded species of birds. 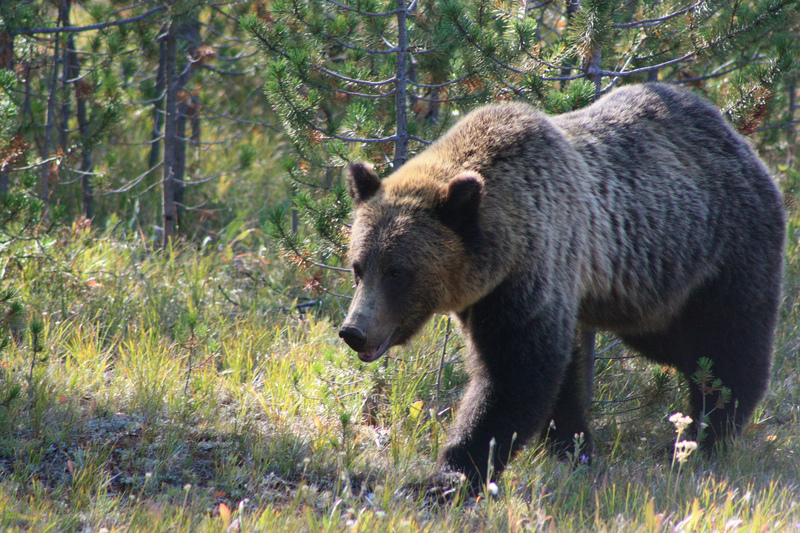 The threatened species under protection are the Canadian lynx, gray wolf and until recently, the grizzly bears. Yellowstone National Park is also home to over 16 species of fish, 5 of these are non-native. The most important information to know before entering the park is that your safety cannot be guaranteed. Wild animals are unpredictable and dangerous. Every year many park visitors are injured because they got to close to animal, usually to photograph. There is an average of one bear attack in Yellowstone every year. In 2011, two visitors were killed in separate incidents by bears in the park. It is imperative to have knowledge of bears activities and common sense when encounters do occur. Bison and moose have also been known to charge visitors; bison can run three times faster than a human. Coyotes are quickly turned into roadside beggars and become aggressive if fed by humans. Safe visiting begins before you traverse the park. Stop and get all information regarding the wildlife habitat and traveling patterns. Report all incidents with bears or other wildlife to park rangers. Approaching on foot within 100 yards of bears or wolves or within 25 yards of other wildlife is illegal. For best viewing of Yellowstone’s variety of wildlife, Lamar Valley offers wildlife enthusiasts an abundance of different species. This expansive valley houses the park’s bison, coyote, elk, wolf, and grizzly bears. It is best in the morning or at dusk to have the opportunity to see the bears or wolves. 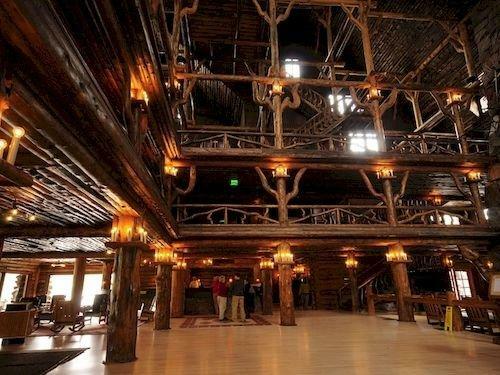 Old Faithful Inn is the most popular hotel in Yellowstone. It was built with an asymmetry of the ‘chaos of nature’ in 1903. The lobby features a enormous fireplace, a 65 foot ceiling and beautiful railings made from twisted lodgepole pine. There are 327 rooms available and reservations are hard to get during peak summer season. 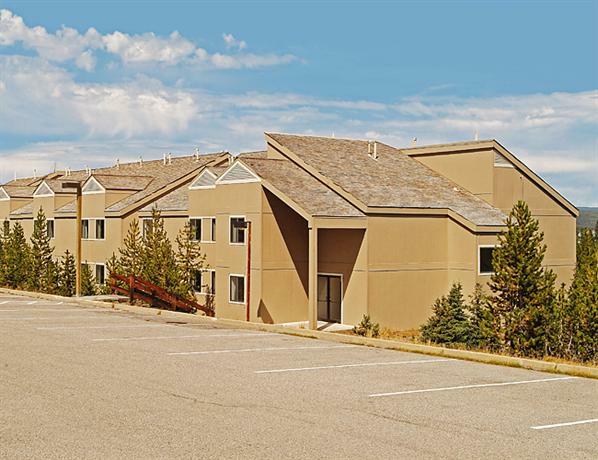 Old Faithful Lodge also has numerous accommodations and is high demand. This premier lodge offers a cabin style experience. Both have restaurants, gift shops and a coffee shop. The Lake Lodge is a beautiful luxury lake hotel and offers rustic accommodations. 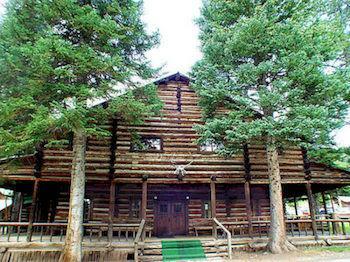 The gracious lodge was built on grounds previously known as a gathering place for Indians, trappers, and mountain men. This hotel is now on the National Register of Historic Places. There are numerous places within the park to access lodging. Yellowstone has nine lodges with more than 2,000 rooms and 12 front-country campgrounds of over 1,700 sites. Some of the more budget friendly accommodations exist at the various entrances of Yellowstone. West Yellowstone is an amazing place in itself, offering some of unique experiences for a solid great vacation experience. 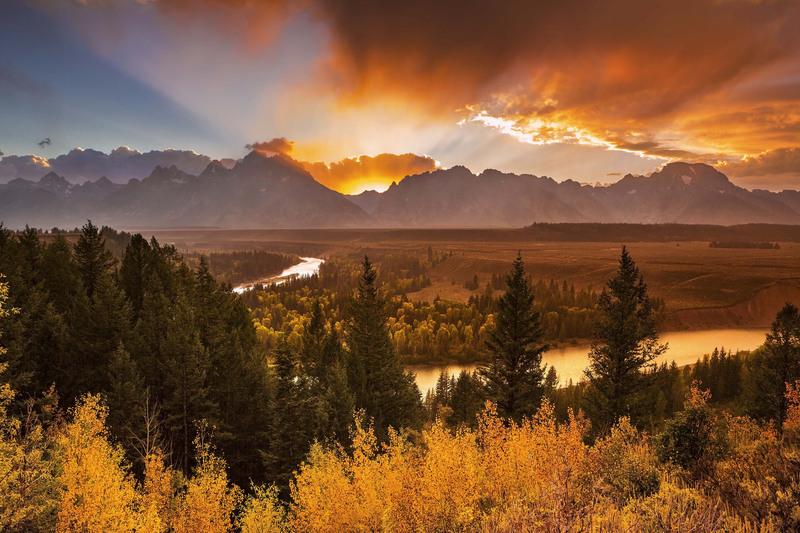 By Plane- Commercial airlines serve Cody and Jackson, Wyoming entrance, Bozeman and Billings, Montana entrance, and Idaho Falls, Idaho entrance all year. 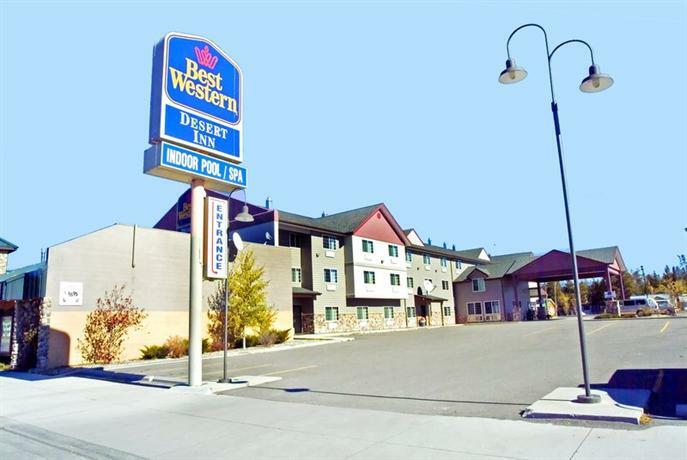 The West Yellowstone, Montana airport is available from June to early September out of Salt Lake City, Utah. By Car-Yellowstone National Park uses five entrance stations. Carefully read about access at each entrance for different times of year, some areas of Yellowstone are not accessible during winter. Many other factors can affect your driving experience in Yellowstone such as road construction or accessibility, and fast changing weather. Make sure to check visitor’s center for current information regarding any obstructive situation. Vehicle Navigation Systems and GPS units may disclose inaccurate information leading drivers the wrong way, or sending them on roads which are closed to the public at certain times of the year. Use the provided park road maps given at the entrances. There are more people hurt by bison than by bears every year in Yellowstone. The 1988 fires affected 36 percent of the park, over 1.4 million acres The North Fork Fire, started from a discarded cigarette. 25,000 firefighters and 120 million USD are unable to stop the massive flames roaring from June through October. Early winter snows finally extinguish the flames. Ninety-six percent of Yellowstone National Park is located in Wyoming, with only 3 percent in Montana and a mere 1 percent in Idaho. On February 9, 1933 the all time lowest temperature is recorded. It was 66 degrees below zero, giving these states an unwarranted cold reputation for having severe winters. After the reintroduction of wolves into the park in 1995, wolves become the most sought after animal for park visitors. Ranchers outside the park choose to pursue the wolves for other reasons, and the heated controversy about wolf preservation begins and continues to this day. Yellowstone is listed as a “World Heritage Site in Danger”. 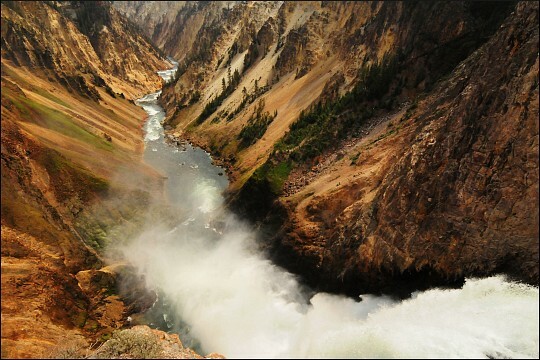 Yellowstone National Park is the number one park in America, drawing over 3 million visitors each year.